TNPSC VAO Exam was conducted on 14-06-2014 to fill up about 2342 Village Administrative Officers in the Government of Tamilnadu. Now TNPSC has published result and rank (Over all rank and community rank) details of 671506 candidates (out of total 763880 candidates who have attended the exam) . * This table does not included the internal reservation for Women - 30%, Ex . Service - 5% , PH - 3% and PSTM with in each community. * This is purely approximate and for demonstration purpose only. TNPSC VAO 2014 Counselling Date ? 15-12-2014 : The most awaited VAO Result 2014 is published by Tamilnadu Public Service Commission today. www.TNPSCPortal.in congratulates all the successful candidates and wishes all others to have better luck in the upcoming TNPSC Group 4, Group 2A, Group 2 and Group 1 exams. Keep visiting this page for latest updates . 12-12-2014 : Today TNPSC has published the result of TNPSC Group 2A and the Hall Ticket of TNPSC Group 4 2014 exam. Most probably, the next announcement from the TNPSC will be TNPSC VAO Exam 2014 result. The result is expected with in any time before 15th December. Read the TNPSC Chairman's note on TNPSC VAO Result Date from the news updates below. 01-12-2014 : On 08-11-2014 , the TNPSC Chairman has informed the media persons that the TNPSC VAO Exam Results will be published with in three or four weeks. So we can expect the result of TNPSC Village Administrative Officer (VAO) Exam 2014 in the next week (December 2014). 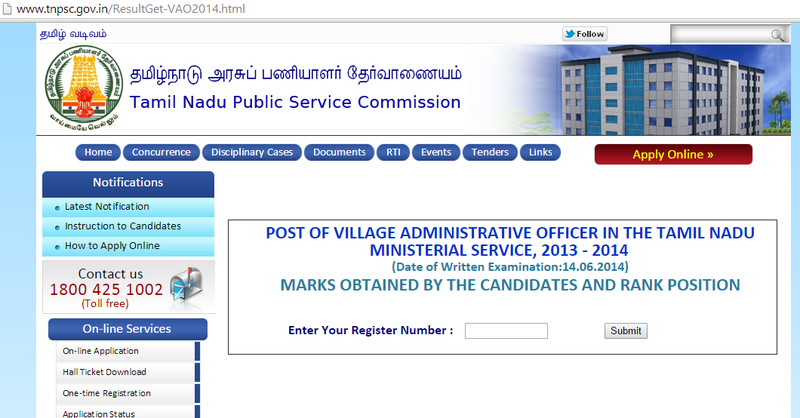 31-10-2014 : When will TNPSC Publish VAO Exam June 2014 Result ? - Dinamani Newspaper Article . TNPSC VAO Exam 2014 was conducted on 14-06-2014 for filling up 2342 posts . Now already 4 months over. TNPSC yet to publish the result of TNPSC VAO Exam 2014.The newspaper article says that more than 7 lakhs candidates who wrote the exam are eagerly waiting for the TNPSC VAO result. Many candidates who wrote the exam well are in a confusion whether to apply for TNPSC Group 4 Exam 2014. 26-09-2014 : TNPSC VAO Exam 2014 (14-06-2014) Result is expected in the month of October 2014 . Dear aspirants, if you are confident with the cut off marks according to TNPSC'S Official VAO Exam Answer Key ( See TNPSC Portal's Expected VAO Exam Cutoff Marks ) , you can wait till the result . Otherwise start your preparation for next TNPSC Group 4 Exam 2014, announcement for which is also expected soon . 10-09-2014 : TNPSC has published the result of TNPSC Group 2 Preliminary Exam December 2014 on 08-09-2014 . As TNPSC has already informed , we can expect TNPSC VAO Exam 2014 Results in November or December 2014. 26-08-2014 : TNPSC VAO Exam 2014 Results will be published with in two months - TNPSC Informs. 21-06-2014 : According to the TNPSC Annual Planner has been Published in the TNPSC Website www.tnpsc.gov.in , VAO Exam 2014 Result is scheduled to be published in the first week of September 2014 . Though it is a tentative schedule, we can expect TNPSC will publish the result as scheduled or little later. Because it has conducted the VAO Exam 2014 on 14-06-2014 , the same date mentioned in TNPSC's Annual Planner Schedule. When will TNPSC Publish VAO Exam 2015 Notification ? If you missed this 2014 VAO , don't worry the 2015 VAO announcement may be published soon. All the details about VAO Exam 2015 will be published with the TNPSC Annual Planner 2015-2016. So we have to wait for the TNPSC Annual Planner which is to be published.